This jersey captures one of my favorite quotes. I’m very excited, and more than a little honored, to share some good news. As you probably know after reading a few blog posts, I am a bone cancer and melanoma survivor. In fact, this summer I celebrate 20 years as a bone cancer survivor. I’m so grateful and blessed to write that! You probably have also read about my love of being active, including cycling. Since I bought my road bike almost two years ago, I admit I have accomplished so much more than I ever dreamed possible. Last year, I biked in RAGBRAI in Iowa with Team LIVESTRONG to raise awareness of and funds for LIVESTRONG’s cancer programs (and am doing this again this summer! ), and accumulated the most miles I have in a year. More importantly, biking has reminded, and taught, me many things about myself – I’m stronger and braver than I often give myself credit for, my determination (and tiny stubborn streak) can accomplish huge goals, biking a few miles is better than no miles when you’re having a tough day, smiles and laughter are often the best part of the day, a little kindness can make anyone’s day better, and life is short and precious so don’t wait for “the right moment” to do something, tell someone how you feel, make a choice that brings you joy or accept those opportunities. So you’re probably wondering what the heck is this good news?? I really took forever to get to it, eh? Sorry, totally got sidetracked. 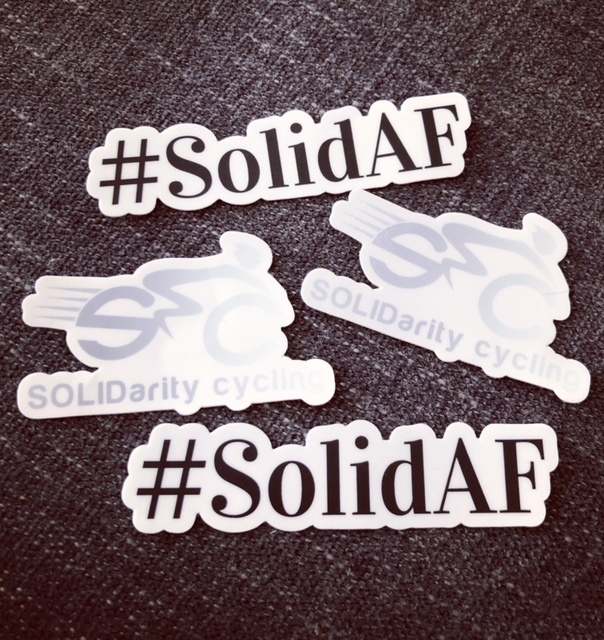 Here it is: I’m really pleased to share that I was recently invited to join SOLIDarity Cycling as one of their company ambassadors! 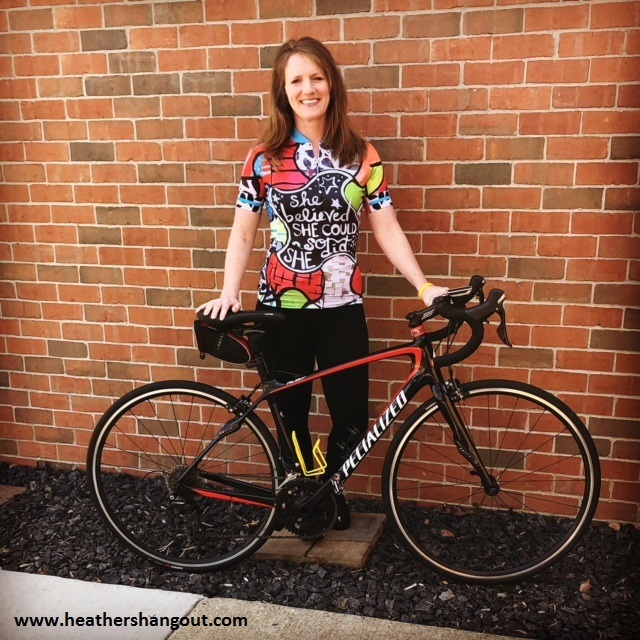 I’m honored (and super excited) to support this newer company that creates beautiful cycling jerseys, designed by female artists, for female cyclists. A portion of the company’s proceeds benefit charities that encourage women and girls to get on bikes. The focus also is on community involvement, encouraging women and girls to get on bikes and into the outdoors, and lots of other good stuff. In the short time I’ve been an ambassador, I have encountered some amazing people. From the two founders, Eliza and Eric, to the other ambassadors to the cyclists I continue to meet on this journey through life, I am again touched by the support, camaraderie and inspiration flowing into my life. This is another reminder that while we sometimes question the journey we’re on (I know I’m not the only one who does this! ), it typically is the path we’re meant to be on. Cancer dramatically changed my life, and it has taken too many people and abilities from me, and yet, there are many wonderful people and opportunities that I admit crossed my life because of my cancer experience. I can’t regret those moments. I encourage you to check out SOLIDarity Cycling for some great biking clothes, and simply just to check out a growing company led by inspiring people trying to make a difference in the world. This is definitely my favorite type of company to support! Congrats on 20 years! I enjoy biking but I definitely not in enough shape right now to do some seriously cycling haha. I’ll have to start small and work my way up. Thank you! I definitely worked up to longer bike rides by starting with short distances. Good luck! Wow! Congrats on being a survivor for 20 years! That is amazing. What a great cycling program that you’re a part of too. I’ve never been cycling. Honestly, it intimidates me. I’ve been trying to get back in shape though so I think I might give it a try soon. I definitely recommend getting on a bike. It’s great exercise and fun. Start with short rides and feel the enjoyment (and don’t forget your helmet!). Congratulations! Cycling is such a great way to do some low impact exercise, everyone should try it 🙂 Thanks for sharing! Cycling really is a great workout, and fun! Congrats on 20 years! You are an inspiration. I love to cycle! Im just at the spin class level but want to move up to riding on trails. This was awesome!! !